Optional wall extenders contain lighter materials and let you pile them high. Adds 12" to the height of the Versa-Trailer's walls. This trailer exceeded all of my expectations. I have used a mini excavator, a four wheeler and this trailer to clear rocks some huge from my property. The weak link was NOT the trailer. Buy one. I was so impressed with this cart that I had to write a review. We live on 11 wooded acres so I'm always hauling something mainly firewood. I love everything about this cart. The tires are big and soft and ride over stones and logs smoothly with less bouncing. It's got a nice long tongue on it which makes backing up a cinch. I've had it fully loaded on a sideways steep hill and I haven't tipped it over yet. It dumps easily even when fully loaded. If you have a 4 wheeler you will love this thing! One minor complaint, the rolled over edge was pretty sharp I had to take a file to it to get it smooth, no big deal. We live on 6 acres and this dump trailer is the perfect size to pull behind my 4 wheeler. Shipping crate was impressive and assembly was simple! Well made, ready to go. Good piece of equipment. Works well with 4 wheeler and yard work. I had been shopping around for two years for a rugged ATV trailer that was also not to pricey. I believe the craftsmanship on this trailer is outstanding. Relatively easy to assembly in about an hour. The care taken to pack, protect, and transport this trailer goes above and beyond. I put it through a grueling test traversing a hill with a full load and the swivel hitch worked without a problem. This trailer meets my needs now and I'm sure all my future needs as well. I would recommend it to anyone. Let me start out by saying that I was extremely hesitant to spend this much money for a lawn/garden utility trailer. I researched numerous trailers, but I kept coming back to this one. Only this trailer, had the unique feature I was looking for - The removable front and rear panels. This feature allows me to haul limbs and tree branches that I routinely have to trim back on my property. With the addition of the extended rails, it's hauling capacity for my purposes is truly remarkable. This is an extremely well-made, durable product and fairly easy to assemble. I expect it may very well outlast me. Yes, you can buy cheaper trailers, but I don't believe you will find anything with the quality and yes versatility of the DR Versa Trailer. In short, Wow! Well built and heavy duty. My wife just loves it. An incredibly robust, and well-built trailer from DR. Just what I expected! Looked at many others including those from Cabela’s, ATV Trailer, John Deer, and several other manufacturers with similar all terrain units. I picked up my unit from the local shipping company, saving on drop off shipping. The units needs some assembly, and with simple tools a complete cart is ready to roll in about 45 mins. Great trailer! I've owned this for about a week and it has already paid for itself. It is a very high quality product and I certainly recommend. I liked the 1/2 ton model because it fit better with my Honda Rancher 420 (tongue weight and hauling capacity). 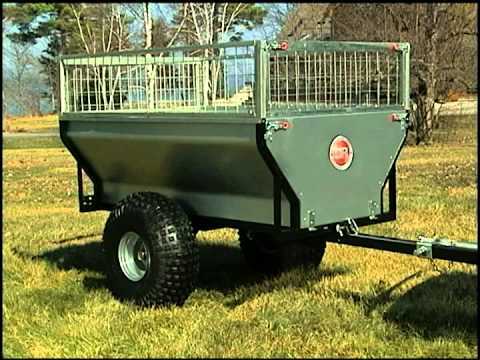 This is a very good trailer for hauling firewood out of the deep woods. It will go where ever the ATV will go although fully loaded I did capsize it once on a slope. Because of the swivel fitting I was able to right it and re-load the firewood - no problem. I usually cut 4' lengths and can load about 1/6 of a coard into this trailer. With one person cutting and the other hauling 2 - 3 cords can be handled fairly comfortably in a day. The dump pivot is well placed and works well when dumping loose material by hand or with the crank depending on where the load is. Cons - If the trailer is stored outside without the dump engaged water sits in the frame and rusty water will rush out when the dump is engaged. The tires deteriorate somewhat rapidly with UV exposure (cracks within a year). I have used armour all. All in all just what I was looking for. Response from DR SupportWe appreciate you taking the time to post a review. Thanks for doing that! You bring up a good point about having the bed raised a little to drain when stored. We haven’t heard others mention the tires cracking, but we will pass your comments to our Product Development department for review. We’re glad that you are putting the Versa Trailer to good use! East to build.Started to rust in one week,bad paint job..May return it. This trailer is sweet. Smooth and quiet when being towed, no rattles. Dumping is easy, when the pin is pulled it's balanced so just a small lift and it dumps. Tires are aggressive with good traction. The pivoting hitch avoids trailer from tipping. End panels remove easy but compared to my old trailer takes a little more effort, then the usual lift gate. It's a good size for driving on old logging roads and pulling up trails on mountains. Was concerned about the shape of the bed, but can handle huge payloads. Some of the edges are rough and can be touched up with a metal file. Purchased from nearby dealer...no shipping charge and assembled for no extra charge (TPC Power Center). It appears to be built for the long haul.